It isn’t long since Toronto-born claw-hammer banjoist, singer-songwriter Kaia Kater was in the area, her time was at the Sage. Before Kater had the opportunity to show off her wares, local duo, Jinski did their bit. Steve Wegrzynski and Dave Kennedy warmed the stage for Kater in accomplished fashion. Bringing with them a tidy assortment of some strong songs, flowing melodies, harmonies and impressive guitar of Kennedy and character in Wegrzynski’s vocals prompted the audience to acknowledge their appreciation. Among the songs to impress, as they included slices of the area “Never Gonna Work Again”, “Take The Train” and “Long Live The Day” all showed quality. Opening for the genial Rhiannon Giddens was a good gig for Kater only here she was allowed freedom to express herself fully, and opportunity to interact with the audience. Steeped in music of the American Appalachian Hills; she studied music for four years in West Virginia and is influenced by among others, Ginny Hawker. Kater knows her stuff. Kater’s gig had a fine balance with a cappella pieces, instrumentals and shared vocals with fellow musician, upright bassist Adam Ryan (“Harrow And The Plough”) to go with her own lead slots. Nothing swanky, no slick licks just first class musical entertainment from beginning to end; the likes of Sierra Hull, Bella Fleck, Allison Brown and all-round picker Sarah Jarosz now have company. 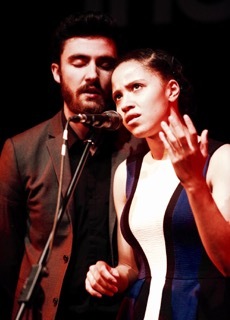 Kater’s finest work included a cappella piece “Harlem Little Blackbird” – this as her partner, Ryan showed off his expertise performing hambone plus you had a song about her grandparents. The composition in question was sensitive ballad, “Saint Elizabeth” that pulled to one’s heart as she reflected on their lives, and the effect of dementia to her grandmother and lives of those she loved. Closely followed and arguably finer still Kater spoke of modern day inequality in the terrific song “Paradise Fell”, and the title-track of her album “Nine Pin”. On the brighter side Kater introduced a little Cajun into her act via “Little Sorrow” (sung in French), appropriately written while in Breaux Bridge (the Crawfish capitol of the world) Louisiana it again underlines the detail mined when it comes to writing new material. Not surprisingly much of the material performed came from the record, but as already noted Kater’s repertoire stretches beyond a selection of songs to cover a set! Drawing on personal heartache and a story to go with it after a painful breakup “Nine Pin” the audience were struck by her composure and the exquisite mood enhancing tone of her playing. Kater possess a wonderful assured calmness and more than enough natural ability to make you believe here is someone who is going to be around a long time. If proof were needed you only need to hear her performance of her own traditional based song, ‘Little Pink”, and you would at least consider my belief that she will undoubtedly become even better and like with Rhiannon Giddens more widely known in time.